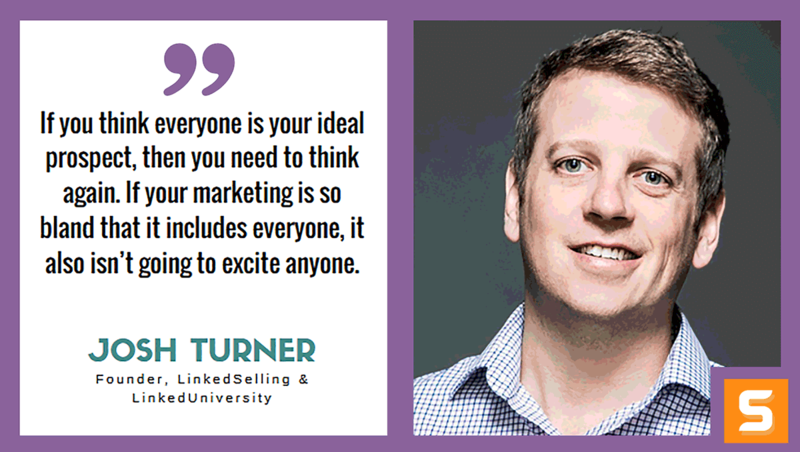 Josh Turner has designed and led successful LinkedIn marketing campaigns for a variety of clients within many industries. He is the founder of LinkedSelling and LinkedUniversity, the definitive and comprehensive guide and online training platform for building a successful business on LinkedIn. In this interview with Startup Savant, Josh shares how he got the spark to become an entrepreneur, and how he successfully became the leader in LinkedIn marketing space. Josh also shares his past experiences when dealing with failures, fears and business mistakes, as well as the competitive side that made him successful. You never know if your idea is good or not, until you put it out there and see if it floats. Don’t wait around for the perfect time or the perfect opportunity. Make things happen. If the first idea doesn’t work out, toss it and start over. It doesn’t have to be perfect, you just have to get started. If you want to take the first step toward LinkedIn marketing and learn from the best, follow Josh on Twitter! What ignited the spark in you to start a business? Where did the idea for LinkedSelling and LinkedUniversity come from? I’ve always had an interest in entrepreneurship. My dad ran his own construction business and for years, I thought I’d take it over after college. But then the economy went south and my dad’s business went under. I got into finance and worked for another construction company that eventually closed as well. Construction is a tough business! At that point, I decided I was done working for other people. I’d learned so much about what not to do, and I felt so strongly that it was my turn. At first, I was working as a freelance CFO for businesses in St. Louis. I got involved on LinkedIn and built up a group for prospects in my area, which positioned me quickly as an authority and helped me get the business off the ground. People started hiring me for CFO services…and then they started asking me if I could help them with LinkedIn, after seeing how well it was working for me. That’s how LinkedSelling was born. After successfully running campaigns for other businesses for a while, I realized the next step would be to create an online course teaching people how to do the same thing for their own business. A lot of people just weren’t in a position to spend a lot of money to hire us to do it all for them, but they wanted to learn the strategies and do it on their own. That course became Linked University. What does LinkedSelling and LinkedUniversity do that makes it better than the rest? How did you find your competitive edge? One thing that’s worked in our favor is that we always stayed focused on what we were good at – LinkedIn. People asked us about ads and Facebook and content, but we stuck with LinkedIn. We became THE BEST at that one thing, rather than doing a little bit of everything. After years establishing ourselves in the LinkedIn marketing world, we’ve only just begun branching into more comprehensive marketing offerings for small businesses. But again, we’re teaching others the same strategies we’ve used for our own business and seen a lot of success with. Nine times out of ten, LinkedIn is a great place to start looking for your ideal customers. Almost everyone in a professional capacity is on LinkedIn. Using the Advanced Search feature and Boolean searches, you can single out just about anyone. One of the biggest mistakes is not being specific enough, or trying to go after everyone. If you think everyone is your ideal prospect, then you need to think again. If your marketing is so bland that it includes everyone, it also isn’t going to excite anyone. You’ve got to find the one thing to inspire that one type of person who needs what you offer. Have you faced any failures with LinkedSelling and LinkedUniversity? How did you overcome it? Around 2012 or 2013, I went on a vacation and noticed tons of people reading online publications on their phones and tablets. It was something I could see being really valuable for small business owners, so we decided to create one of our own, a digital magazine called Onward. We spent a lot of money on the app and the design of the magazine. It took so much work putting together the content every month, and it just never took off. We finally took a step back and looked at the big picture. We liked the idea of this online publication, but it had turned out to be a drain on our resources without a lot of return. I decided that we’d gotten too far off course, too far from our niche, so we closed it down. Sometimes, as a business owner you have to be ok with walking away from something that isn’t working. You’ve got to choose your battles, and that wasn’t the battle we wanted to focus our time and money on. I am always afraid that it will all come crashing down. Maybe that’s because I’ve seen too many businesses suffer that fate. It fuels me to stay hungry, never get complacent, to continue trying new things, and focusing on growth. It also taught me that nothing is more important than cash flow, which is one of the key measures we use to determine if we are winning. Is there a type of marketing that has worked amazingly for LinkedSelling and LinkedUniversity? If so, how did you stumble upon it? Well, aside from LinkedIn, webinars have been huge for our company. In the beginning, we were doing a live webinar every 2 weeks. Although they worked well, the constant promotion and prep became exhausting. We realized that the smart thing would be to do one kickass webinar live, and then make it part of an automated system. We made an evergreen webinar, meaning we were careful to remove anything that linked it to a certain day or time, and recorded it live. Then we built out an entire funnel, with ads bringing in new prospects, who watch the recorded webinar, and receive a series of emails. A certain percentage of these convert into buyers, all with very little maintenance on our part. Who has been your greatest influencer along your entrepreneurial journey? How did they shape LinkedSelling and LinkedUniversity? So many people. I would say one of the first was Gary Vaynerchuk, who I followed closely back in 2008-2010. His use of online tools to grow a traditional wine store was a great example that I’ve used in a number of businesses since. And his approach to hard work and customer focus has always stuck with me. A trait that has made a big difference for me is the willingness to just take action, to keep moving forward. If you spend all your time perfecting something, you never know if it will work or not, you don’t know if you’re marketing it to the right people, or in the right way. Sometimes you just have to dive in before things are figured out. That mentality that keeps me pushing forward, trying new ideas and discarding the ones that don’t work has kept us on the cutting edge of digital marketing. “It’s a whole life.” If you become consumed by your business, it’s not sustainable. Balance is so important. When you take time off to recharge, to have fun, to take vacations, to eat right and exercise…all of those things will make you sharper, and your business will be better for it. What advice would you give to aspiring entrepreneurs in Missouri who have a business idea but don’t know where to get started? First and foremost, you’ve just got to get started. Like I mentioned earlier, you never know if your idea is good or not, until you put it out there and see if it floats. Don’t wait around for the perfect time or the perfect opportunity. Make things happen. If the first idea doesn’t work out, toss it and start over. It doesn’t have to be perfect, you just have to get started.